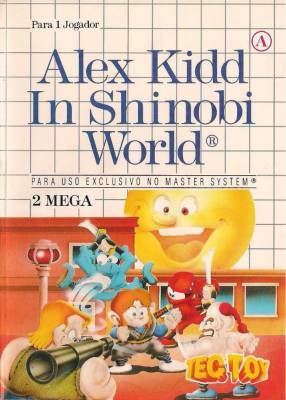 After ten thousand years, the once-banished Dark Ninja returns to make another attempt to take over the Miracle World. Someone's definitely got to stop him! Guess who dares to meet the challenge? You! 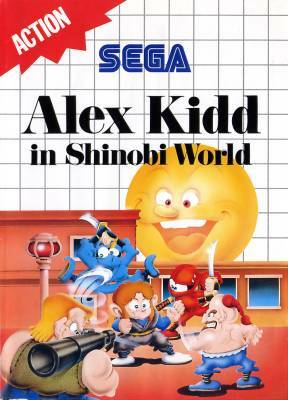 You're Alex Kidd, the prince who knows no fear. A lovely girl has been kidnapped and her life is at risk! 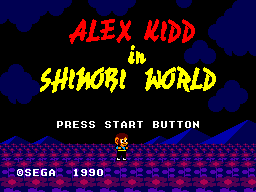 And she's your girlfriend from the planet Shinobi! 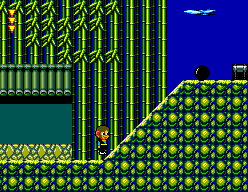 By holding her hostage, the Dark Ninja plans to realize his fiendish scheme. She must be saved before it's too late! You need more than courage to be successful. Transform into a fireball and burn up enemies that come at you. Jump up and across towering walls with your amazing wall-climbing skills. Turn into a tornado and twist your way out. And whn you encounter the Dark Ninja, think only of winning. 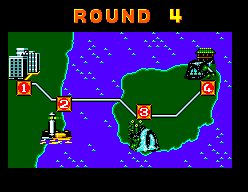 Otherwise you'll lose your girl and, worse yet, the Miracle World will be doomed forever! 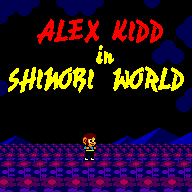 There is a development page for Alex Kidd in Shinobi World. Visit it to see technical discussion of this game.